Managing a small business is hard. With everything you have to do on a daily basis, the best thing is to try and spend less time on repetitive tasks and focus on higher level activities that are crucial for your business. There’s nothing worse than doing something over and over again when in reality it can be easily achieved and automated on a daily basis. Tasks, such as invoicing, are one of those things that you can spend less time on and carry on with the rest of your day. 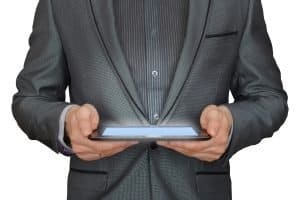 Why use a dedicated invoicing software? I have seen entrepreneurs use Word documents, and Excel sheets for creating their invoices. Yes, you can use these applications for creating invoices, but they pose more significant problems when you have to invoice clients on a daily and weekly basis. You will find yourself shuffling through previously entered information, trying to find saved files, copy/paste pieces of data with enormous chances for error, and the worst part: not being able to organize them properly, search an invoice quickly, or merely edit something across the board. A simple invoice software like Invoice Station does come to the rescue. With the ability to select pre-entered data on a new invoice and add new things without leaving the page, you will save yourself plenty of time and give yourself a piece of mind by not worrying about smaller details on each invoice. As you create a new invoice on Invoice Station you can quickly find your repeat customers or create new ones without leaving the page, create services and products that you can use on other invoices, and add taxes and discounts with a click of a button — all essential to running a thriving entity, and most importantly: an efficient business that doesn’t waste time. Having a dedicated invoice software that does one thing and does it well, is very important when deciding to use a new solution to run your business — and Invoice Station checks all the marks. I found my way quickly through each section. Navigation has only one sub-level, so I never felt like I had to go back very often. The design does not follow the latest trends. It’s very brutalist with clean black lines and text, which is very easy to read. The numbers look good and the final invoice I created seemed very professional. Something I can quickly send to my clients and feel good about it. Invoice Station is currently serving clients all over the world. Its flexible system allows anyone to customize the look and feel of their invoice, so it fits any country’s regulations and laws. You can add your specific currency, change the way dates appear on your invoice, and arrange number formatting. Taxes are not preset for any region, so you are free to add any taxes or commissions, which you can then relate to any service or product you invoice to your clients. Each page in Invoice Station has a little round “question mark” on the bottom-left of the screen. Clicking on that icon will give you a detailed tutorial about that specific page you are on. Example: If you have a question when creating a new invoice, you can simply click on the “question mark” icon, and a pop-up will appear with instructions about each functionality of the new invoice form, with sub-links and cropped images of each section. Invoice Station advertises on their website that they are quick to reply. But, I didn’t find myself actually needing to contact them about anything. 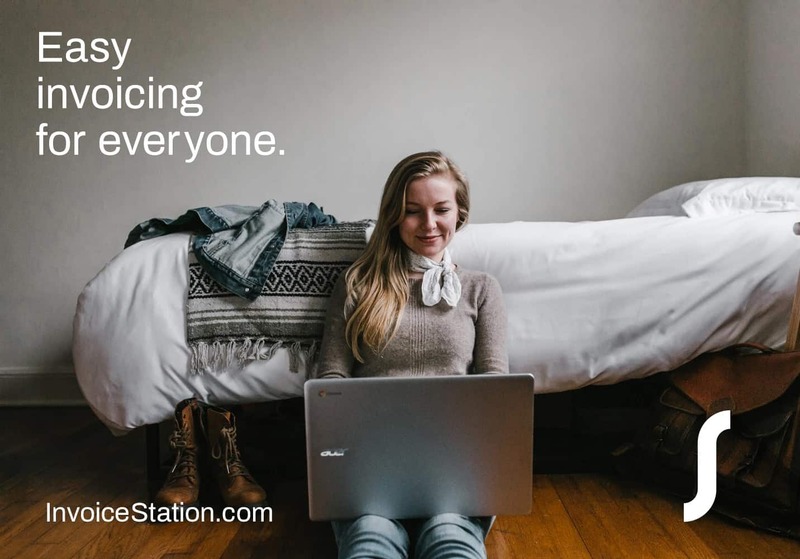 Everything is laid out properly and explained in detail, from pricing and all the way to features, and what Invoice Station does (and what it doesn’t do). Besides invoicing, Invoice Station offers a few other options which are crucial to any small business. For each invoice you issue to your clients, you can register its payments partially or in full. This way, you are always in the know about which customers are behind with their payments. Something you can never do if you create invoices using desktop software like Word or Excel. In addition, Invoice Station allows you to register your business expenses (such as rent, supplies, etc. ), assign them to an outside vendor, and even relate them to a project if you run a service-based business. All these features tie up well in the Dashboard, which gives you a clear view of how your business is doing. From lifetime profits to monthlies, and all the way to showcase what you spend and profit on a daily basis. It looks like they will expand on this feature as it was currently missing filtering analytics by date, categories, and more. You can visit their tour page for more details about each feature.  I don’t think there are many business tools out there that come at an affordable price. Most are priced at a hefty price of $40 and above per month. I think Invoice Station have found the perfect middle-ground in their Essentials Plan, which comes at $59.50/year. That is a recurring charge “per year,” not the month. At that price point, it’s a bargain for an invoicing software that does a perfect job in helping you professionally manage your day to day invoices and even bookkeeping activities of your small business. 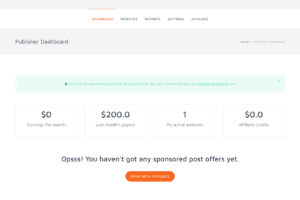 They do offer a Free plan, which is very limited and for someone who is just starting out and wants to get a feel what Invoice Station is all about. You can read their pricing page about each plan in detail. After reviewing the app, I took my time to chat with their customer care team and ask them about their future plans. Their focus seemed to be in creating more options within the app, so it automates even more procedures when invoicing customers. Also (as I was secretly hoping) they will be focusing on adding more options on the Dashboard feature, so it provides more granular analytical detail. 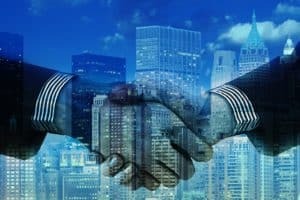 Small business selling a service or product, such as: Marketing, Design, Small manufacturing shops, Builders, Contractors, Legal, Medical, Self-employed, and any other industry that resembles the activities of the above-mentioned examples and invoices their clients for services they provide and products they sell. 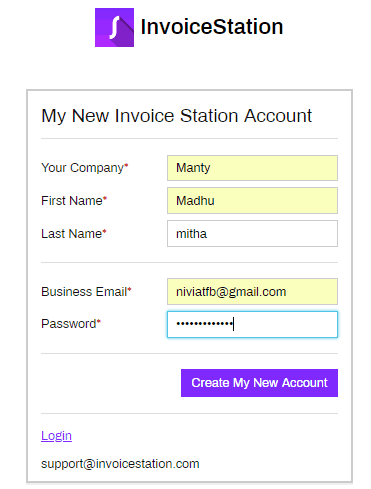 Invoice Station can be used from any browser, and you have nothing to install. 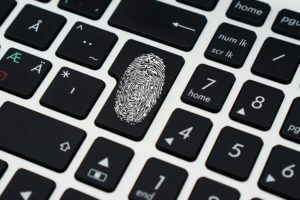 An account you create on your laptop will be easily accessible on any other computer with an internet connection. 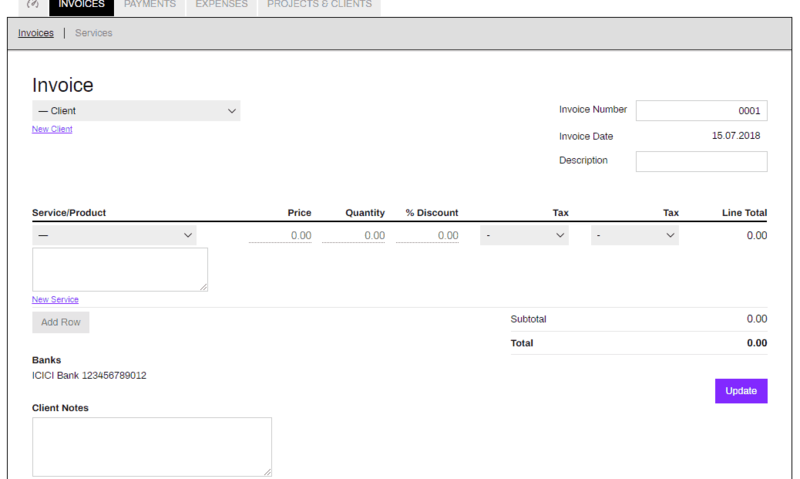 Customization is key: Invoice Station is fully customizable. From currency symbols all the way to date and money format, it is easy to use across countries based on the geography of your business. Nothing serves as flexibility does: Provision for dynamic addition of clients, services, projects. You don’t need to have your clients, projects, services pre-set in the system. 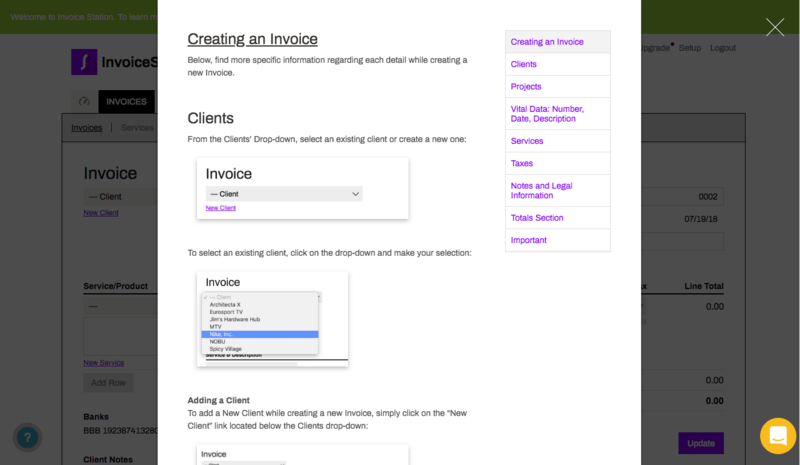 You can add them as you create your invoice which is a very flexible feature when it comes to creating new invoices. Customers truly care: Invoice Station Customer Care provides extremely good customer support by assisting every customer from day one when they first signed in. It also provides with self-learning features which helps customers get clarity with their questions through multiple means. Pay less, Gain more: Invoice Station has an affordable price point which is way lesser than its competitors. Software shouldn’t be expensive after all. It also has a 100% money back guarantee if a customer wants to pause using the software for any reason. Invoice Station is a company based in the United States with engineering teams in both Europe and the US. Their team and previous products have already appeared in Forbes, The Economist, Product Hunt, Startup Istanbul, Startup Sauna, and more. Any small business who struggles to manage their finances properly and looking for an invoice software that does the job well will find the perfect match in Invoice Station. Easy to use, affordable, highly responsive, built by a dedicated team, secure, customizable, are a few keywords that come to mind after reviewing and using Invoice Station. 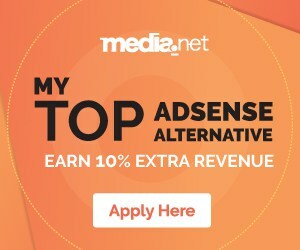 There’s everything to gain with their free registration and testing period. This way you get to use and see every feature before deciding to adopt it long-term for your small business needs. 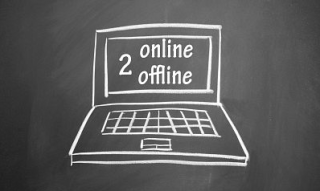 2) Create a new account using the button “Start FREE Account” in the top right corner. 3) You have to fill the basic information like Company Name, First name, Last name, business email id, and password for the account. 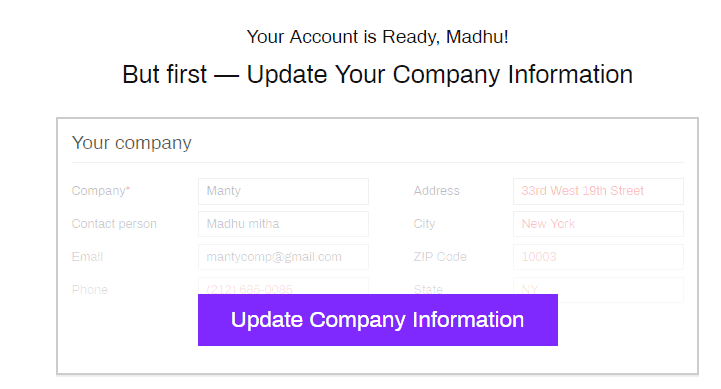 4) Once the above information is filled, click on “Create My New Account” to create an account for your business. 2) Click on the button and you can find new fields like phone, address, user guide and invoice logo. 3) Update your business contact number, address, city, zip code, state, and country and move to the user guide. 4) If you would like to fill your company-specific data such as business number, tax id etc., you could update them under user guide. Once all these information is populated, click Update. 5) You will now see the message “Edited successfully. You’re ready to Create an Invoice!” above your company information. 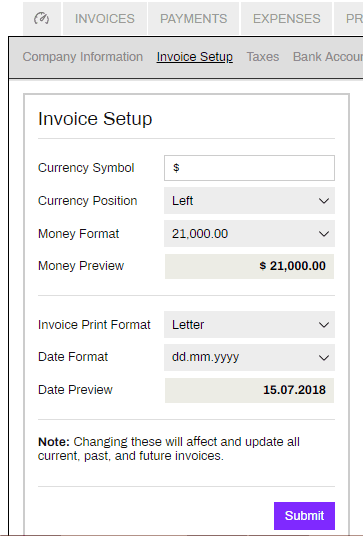 1) You can directly go to “Create an Invoice” hyperlink to start creating an invoice, or use the tab “Invoice Setup” next to the tab “Company information” to update the currency/date format you would like to have in your invoice. 2) Click on “Invoice Setup” tab. 3) In this field you can see currency, money and date formats you would like to have on your invoice. Currency Symbol – You can update the Currency Symbol according to your country, e.g., Dollars, INR, Euro, etc. Currency Position – This field enables you to choose whether you want the currency symbol to appear on the left or right side. Money Format – You have 5 formats to choose from here. You can choose any option based on how you want the amount to appear. Money Preview – This field gives you a preview of your amount based on the currency symbol, currency format and money format you selected from the above options. Invoice Print Format – Whether you would like to have the invoices be printed in Letter format or A4 format, you can choose them from here. Date Format – This enables you to choose specific date formats from wanting to have ddmmyy order till the symbols you want to have as separators. Date Preview – Gives a preview of how the date would appear on your invoice. 4) Once the above fields are populated, click on the “Submit” button. 5) Please note that with the update that is made here, your past, present, future invoices will be updated accordingly. E.g., a date format change made here would also be updated in your past invoices. 1) Click on the Taxes tab next to invoice setup. 2) You can create tax using the “New Tax” button on the right side or if you haven’t any tax before you will find a hyperlink “Add New Tax” hyperlink under tax name, percentage. 3) Click one of these options to add tax information. 4) Provide the tax name and how much % it would be and click on submit. 5) You can now see the tax detail updated along with the percentage. 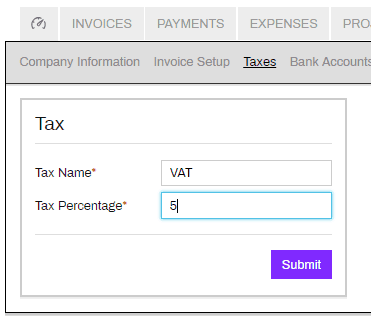 6) You can add more taxes based on your business and populate the same fields again i.e. Tax name and percentage. 7) You also have the option to update these tax fields using the “Edit” button available on the right side next to tax percentage. 8) You can archive/delete any of these taxes using the Archive & Delete tabs above the tax table. 9) These archived and deleted taxes could be viewed under Archived/Trash tabs below the tax table. 1) You can include your bank account for your invoices, this account will appear below each invoice as a guide for your clients for invoice payments. 2) Click on Bank Accounts tab. 3) You can create one using the “New Bank Account” button on the right side or if you haven’t any bank detail before you will find a hyperlink “Add Bank Account” hyperlink in the bank table. 4) Click one of these options to add bank information. 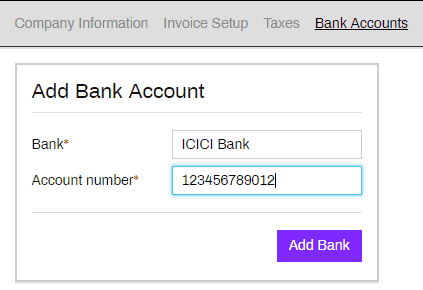 6) You can now see the bank details and can edit/delete this anytime using the “Edit” or “Delete” button available. 1) You can directly go ahead and create an invoice without this step, and give the client and project information dynamically while creating the invoice or you can first set the client/project details and then set invoices for them. 3) Under that click on the tab “Clients” and add your clients’ information. 4) “New Client” screen will open, and you can fill in company information, contact person, address and phone details, and business specific information if any, under user guide. 5) Click on “New Client” button once all the fields are entered. 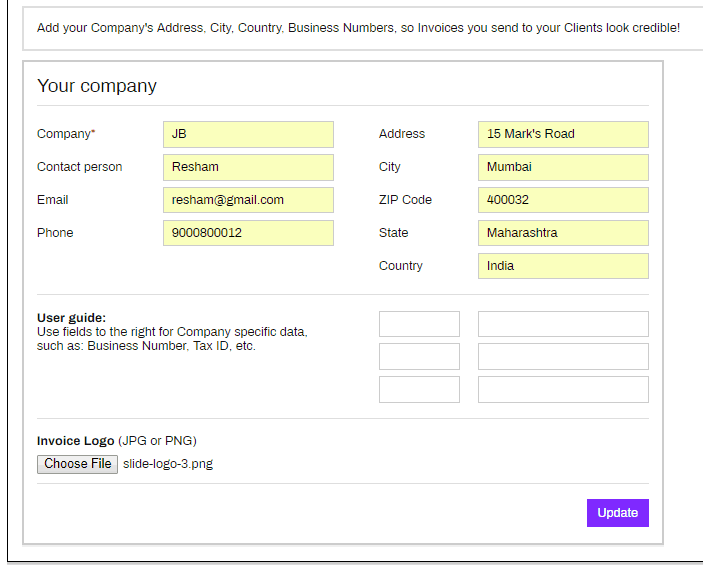 7) Add more clients as per your business, and you can view them all together as shown in below picture. 8) You can edit/delete/archive any of these clients using the Edit/Archive/Delete buttons available. 11) You will see the “Add Project” screen which has a drop-down list for clients and a text box for project information. 12) Click the drop-down list and choose of the clients and provide the project information. 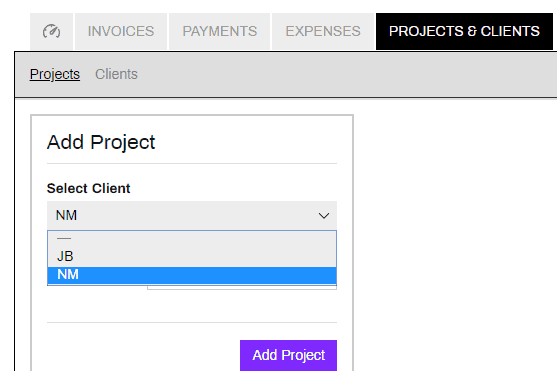 13) Click add project and add more projects under each client as per your business. You can see the final screen after adding all the projects/clients as below. 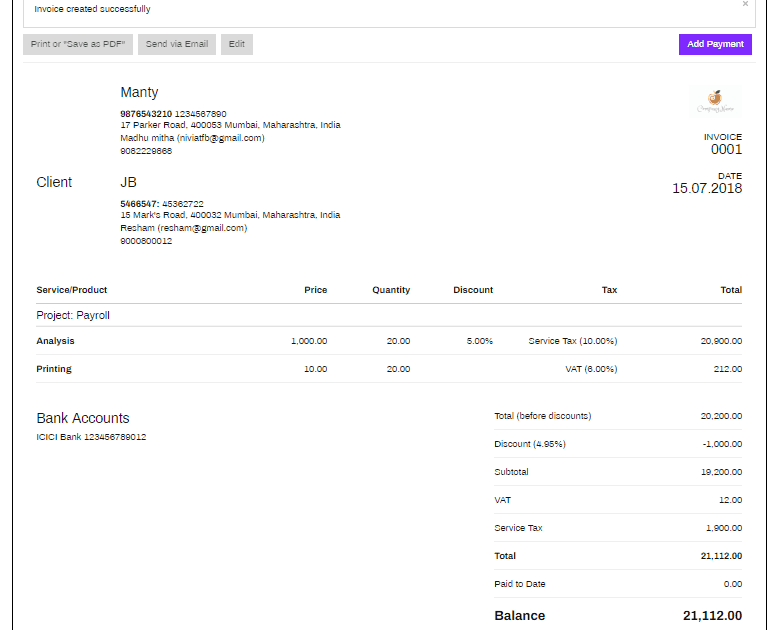 1) With everything set, you can start with your first invoice – Go to “Invoices” tab. 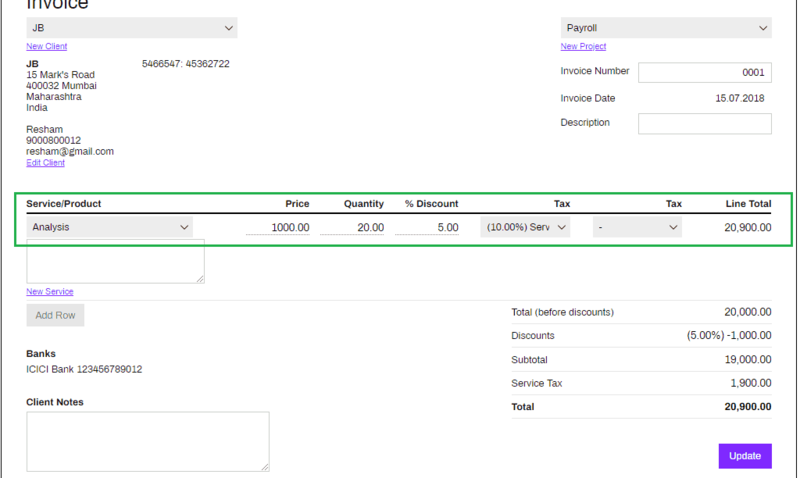 2) You can create one using the “New invoice” button on the right side or if you haven’t created any invoice before you will find a hyperlink “Add New Invoice” hyperlink in the invoice table. 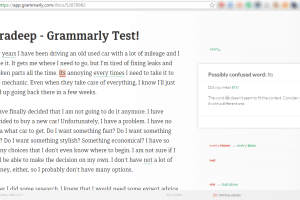 3) On clicking, you will land up at a page like this. You can provide your client details from the client drop-down list or add any new client using the “New Client” button. 4) Click on the Client drop-down and choose one of the clients. 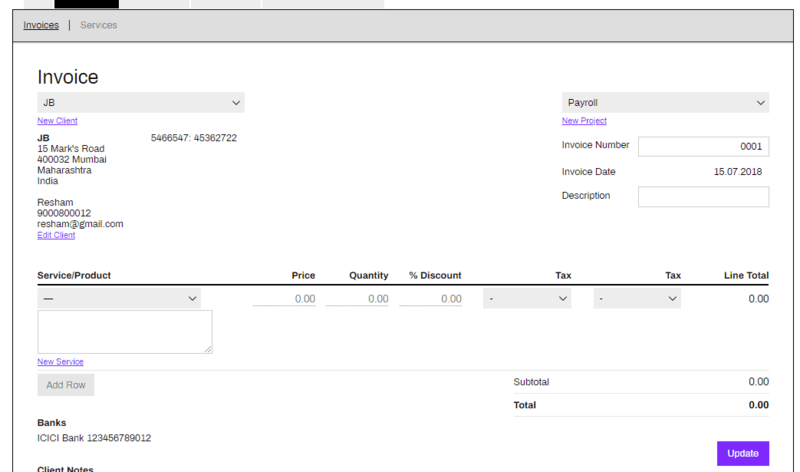 5) You can see that once a client is selected, all its details are populated in the invoice as below. 6) You can click on the Project drop-down list at the right side and choose the project for which you are creating this invoice, or you can add a new project using “New Project” button as well. 7) Click on “New Service” to include the service for which you are charging. 9) You can see the service being added and the total amount before discount and after discount is calculated, and the final amount is displayed post taxes. 10) You can add more services using the “Add Row” button and include more service and compute the total charge. 11) Once that is done, click Update to create the invoice. 13) The created invoice will have your company information, logo, contact and client details along with invoice number, date, services information and final charges for the client. 14) The invoice could be printed, or saved as pdf or sent via email using the tabs available on the top of the invoice. Your first invoice is created successfully. Let us know if you have any other queries in the comments below.